The 1961 Cadillac Series 62 picked up many of Pinin Farina’s styling cues found on the 1960 Eldorado Brougham. They 1961 62s were shorter, squarer and more angular, with the upper tail fin now duplicated as a venturi, lower down. Series 62 models were still six- and four-window four-door hardtops, a two-door hardtop, and a convertible. Engines remained 390-cid V-8s, with 325 hp, and all cars were equipped with an automatic transmission. Popular options included air conditioning, Guide-Matic headlights, and a full suite of power features. A fully optioned car could tip past the $6,000. The Series 62s square profile continued in 1962, with reduced fins and a mild redesign of the grille, with larger front bumper. The Sedan DeVille’s Town Sedan migrated to the Series 62 line. 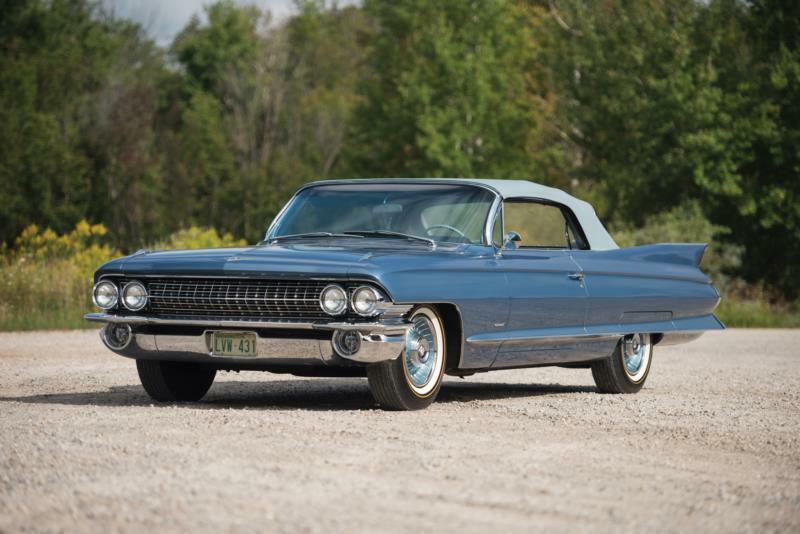 Cadillac returned to the basic 1960 profile in 1963, with all body side folds eliminated. The 1963 Series 62s had a squarer profile than the 1960 models, with a thick “T-Bird” C-pillar and a single side trim strip. The Town Sedan was dropped from the series this year, and the convertible was the most popular model. The only obvious changes for the Cadillac Series 62 in 1964 concerned the grill, which now had a body-colored divider across it. Beyond that, the two years are hard to distinguish. A first for 1964 was climate control, which could be changed by a simple thermostat knob on the dash. The convertible was moved from the Series 62 to the DeVille model. Strong sales of the 1963 and 1964 Series 62 models make them a better choice as a beginning collectible car. Higher production numbers make it easier to find good quality examples, and it also means that trim and body parts are easier to source than on the 1961 and 1962 models. Build quality is quite good on all Series 62s of this generation, and all of the body style have a commanding presence.